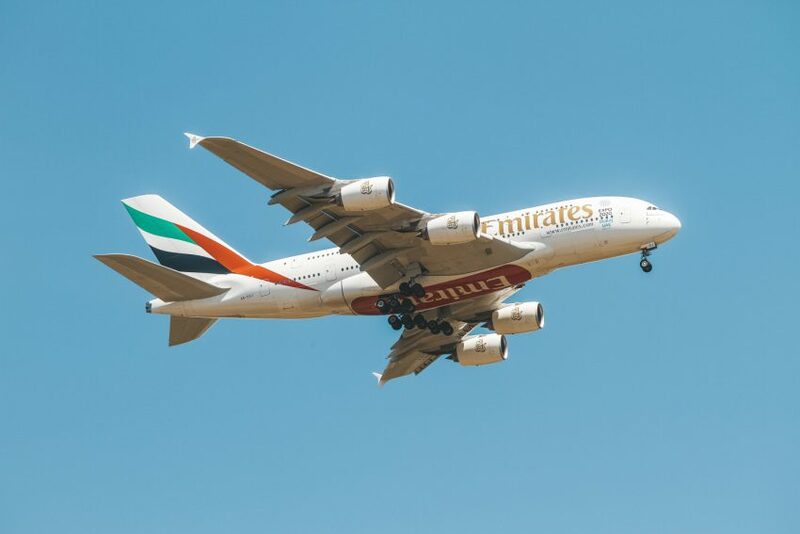 In this post I will tell you about the experience and obviously show you the first deck of the biggest airplane in the World. 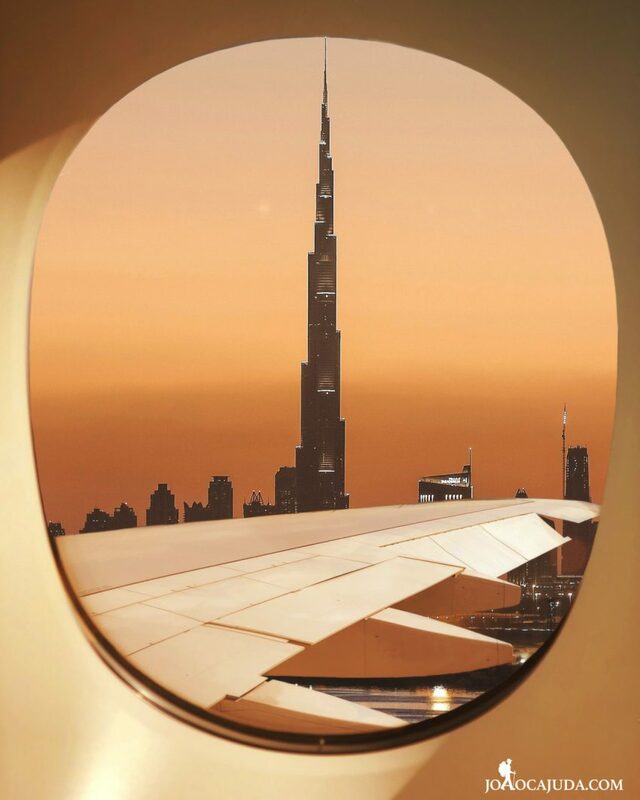 In addition I will also tell you a little more about the biggest restaurant flying in the world, yes it is Emirates and will be surprised by some curiosities that I found out! 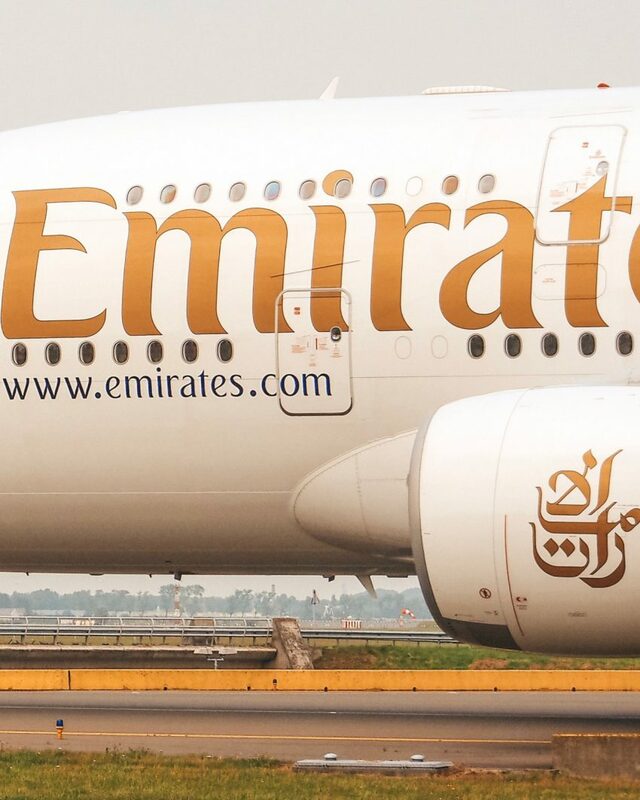 The trip to Sydney with Emirates has a stopover in Dubai, it is approximately 8 hours from Lisbon, followed by 14 hours to Sydney. The second leg of the trip as I told you is done in the great A380. 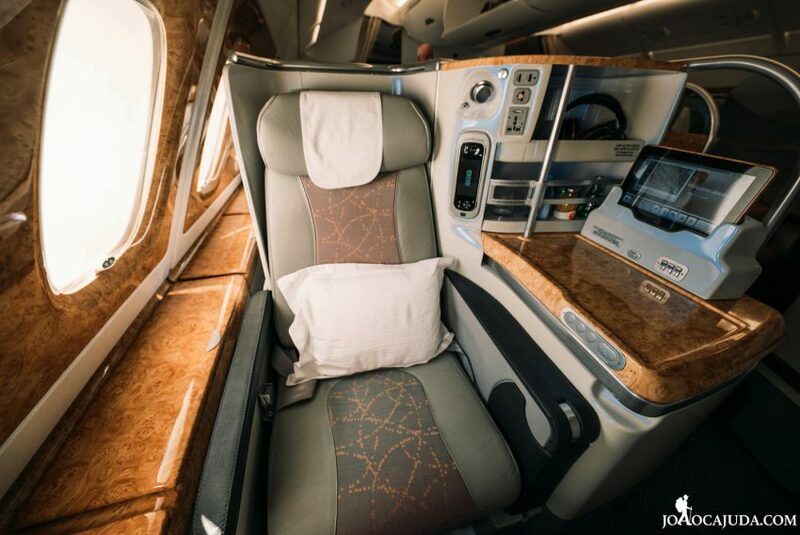 Downstairs is the economy class, while on the upper deck is the first class, the business and the onboard lounge of the plane. 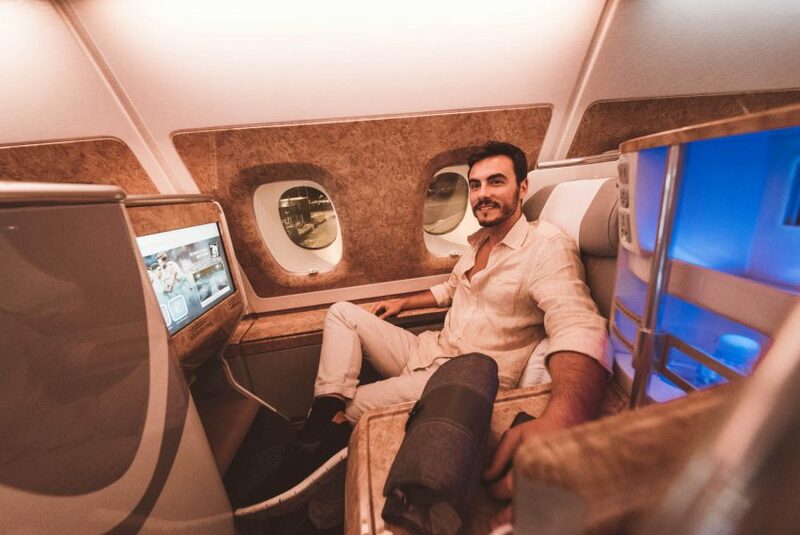 The most spectacular part is of course the Lounge, it is located at the end of the plane and it is nothing less than a bar where you can go for a drink, snack a macaron, or simply chat with other passengers. 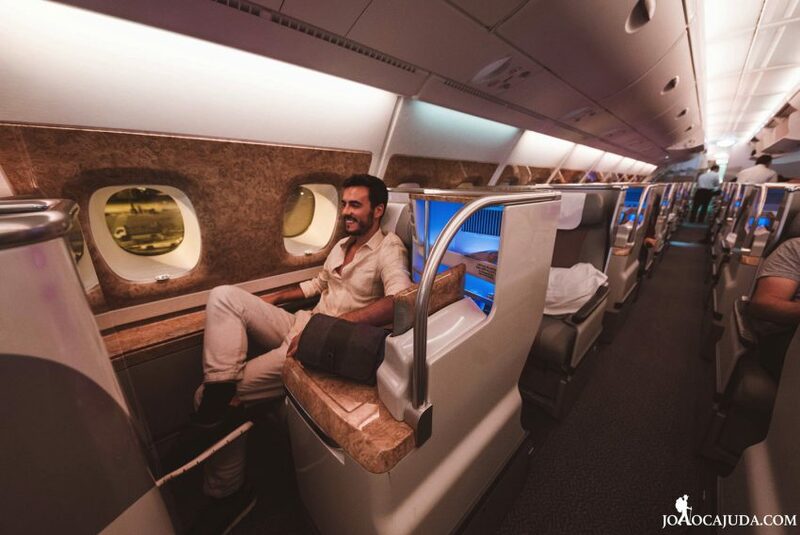 The world’s highest lounge, to be precise at 44,000 feet, has relaxing LED lighting, surround sound, a 55 “TV and comfortable benches so you can enjoy your drink! There are a total of 76 Business accents in a 1x2x1 configuration. 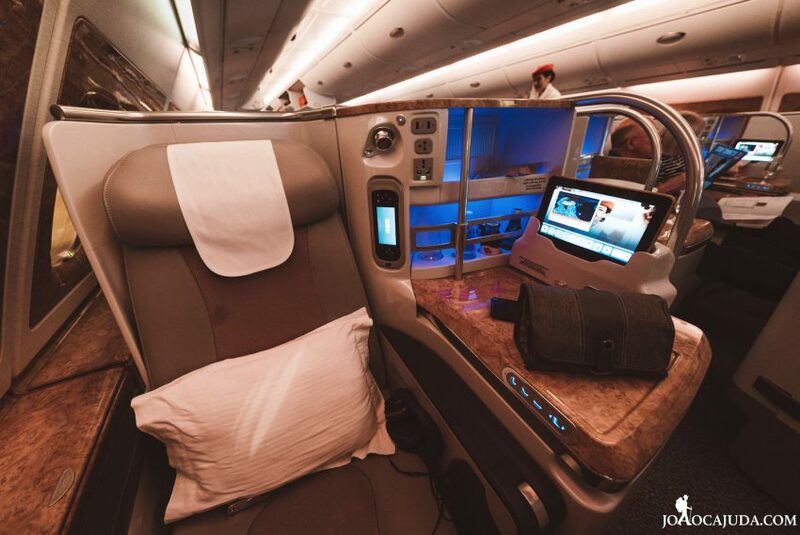 The seats are large enough to lie flat, fully stretched. You also have a private mini bar with a few drinks, various storage areas, a tablet and a 23-inch TV. 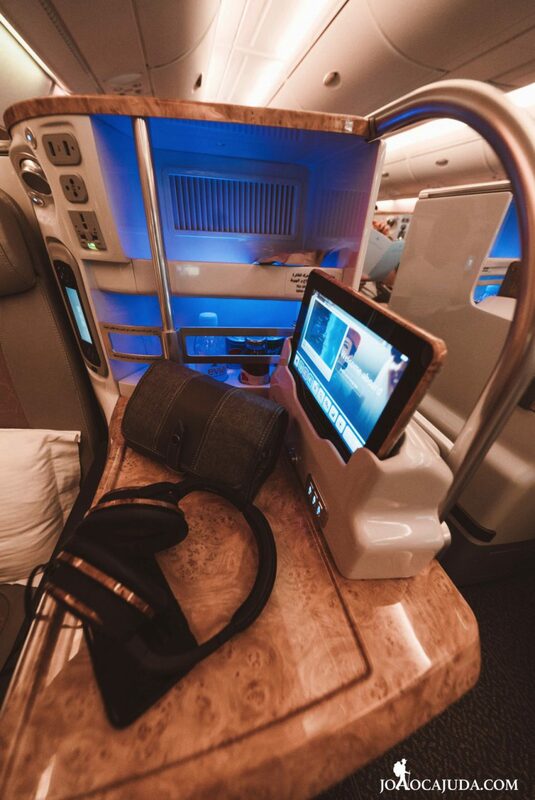 The onboard entertainment system no longer needs presentations, Emirates’ award-winning “ICE” has 2,500 entertainment channels and you can watch in addition to movies, documentaries, etc, live channels! 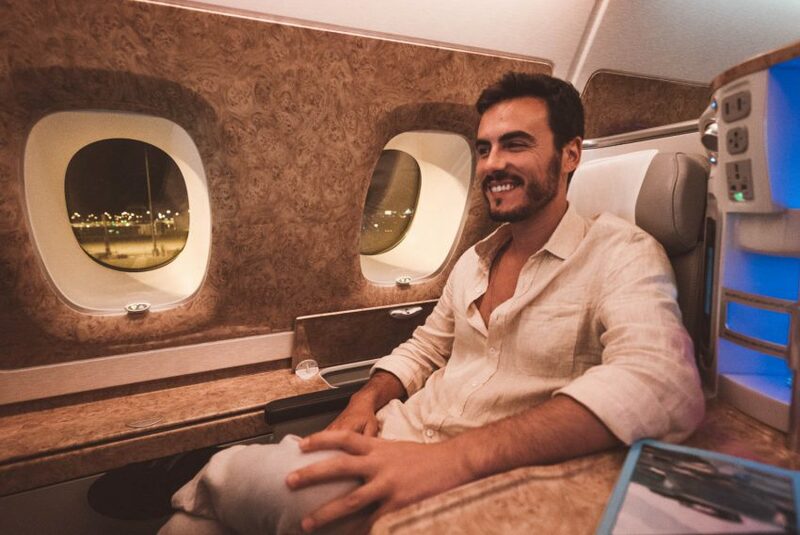 All passengers are entitled with 20MB of free Wi-Fi internet, in case you are a skywards member and travel in Business you have unlimited access which is wonderful not only for those who need to work but also for social networking and whats’app addicts eheh. 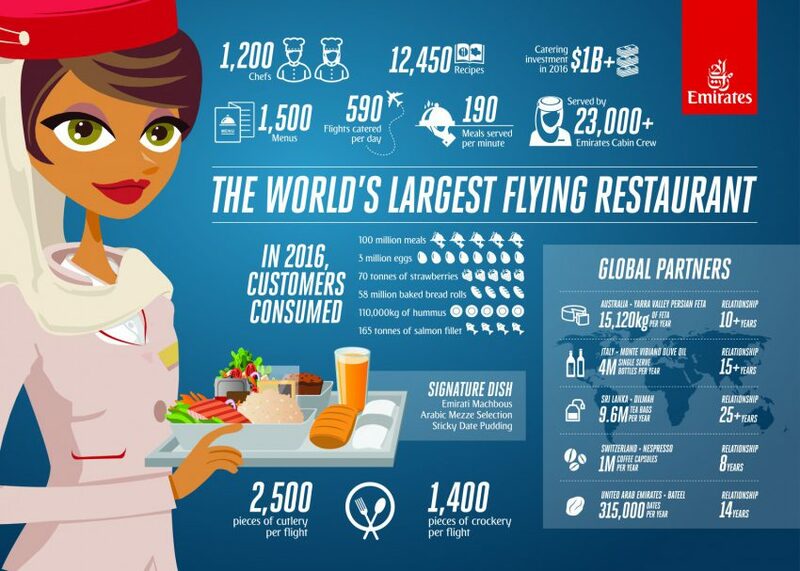 Now let’s talk about food, did you know that Emirates is the biggest flying restaurant in the world?! 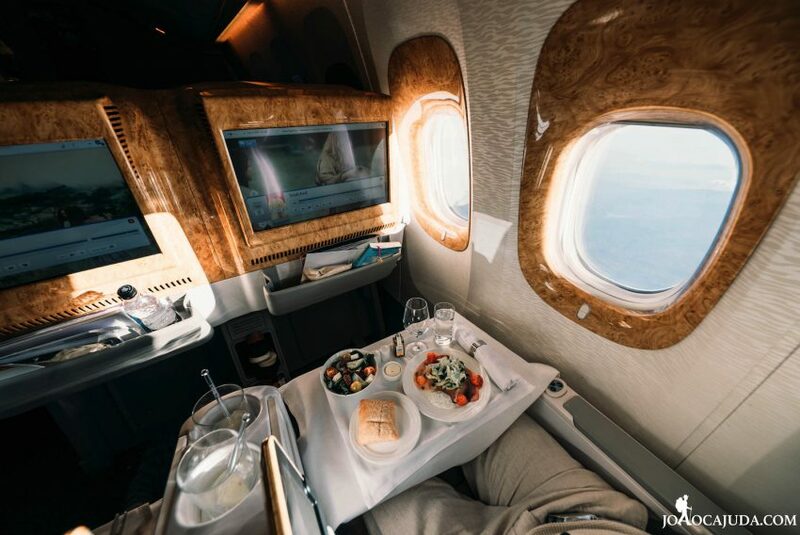 Emirates serves more than 100 million meals a year with the same attention to detail in all classes, whether in First, Business or Economy. 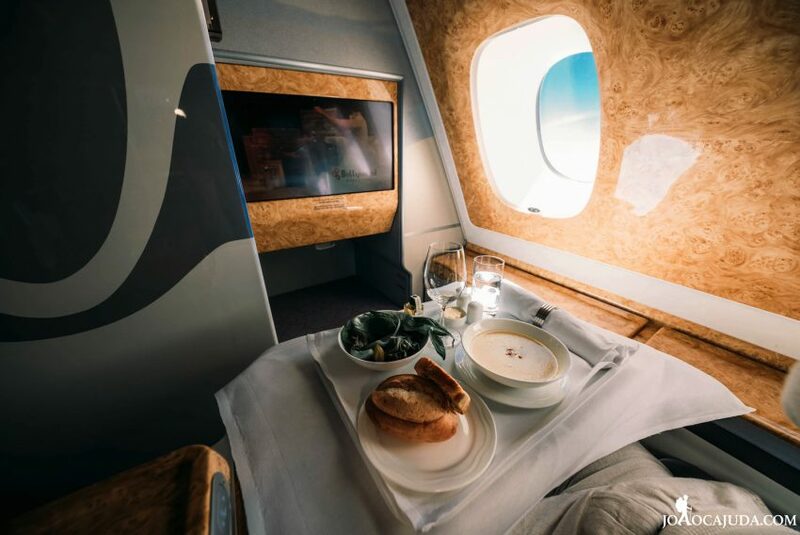 With more than 55 million passengers traveling annually to and from 144 cities on six continents, no one knows the gastronomic trends better than Emirates, which serves dishes inspired by each destination. The Emirates kitchen operates 24 hours a day, 365 days a year. Based in Dubai with 1,200 chefs, offering a total of 12,450 culinary recipes and 1500 different menus. 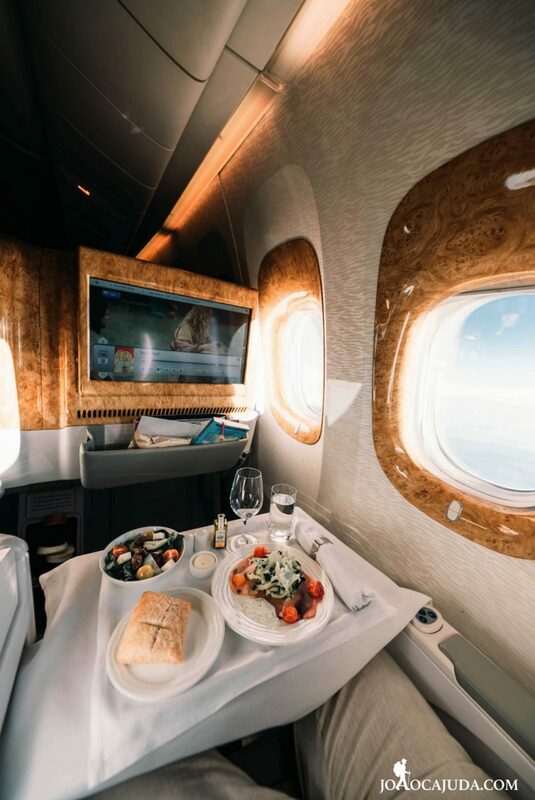 Rigorously aligned, the Emirates kitchen serves 590 flights per day, more precisely 190 meals per minute, with authentic regional dishes, providing to passengers a culinary experience of the destination they are traveling to. 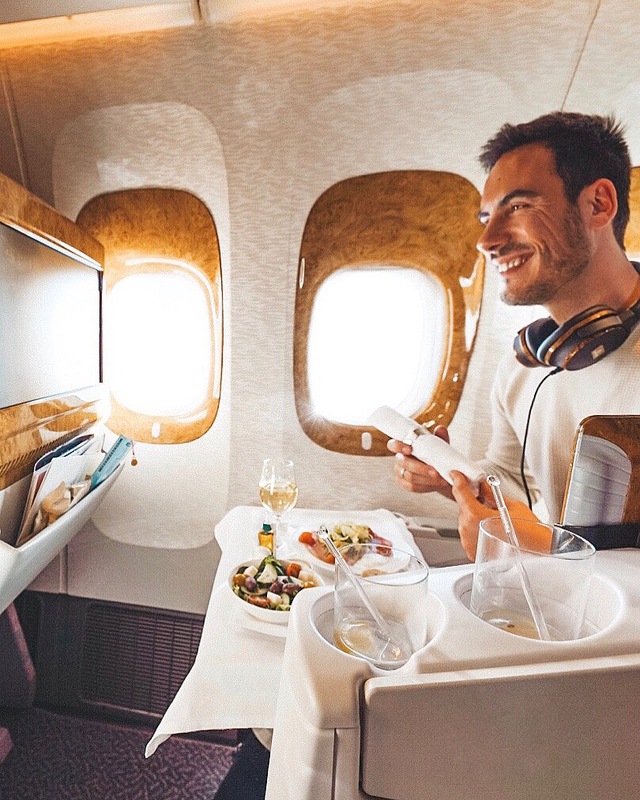 For example, I was able to try the recently launched menu for their Australian routes, inspired by the country’s variety of multicultural flavors, following a 14-month process of researching with local chefs. The new menu features a wide range of traditional local dishes such as lamb sausages with mint. Reflecting Australia’s multiculturalism, the menu also includes Asian flavors and Middle Eastern ingredients … And yes, everything was delicious! 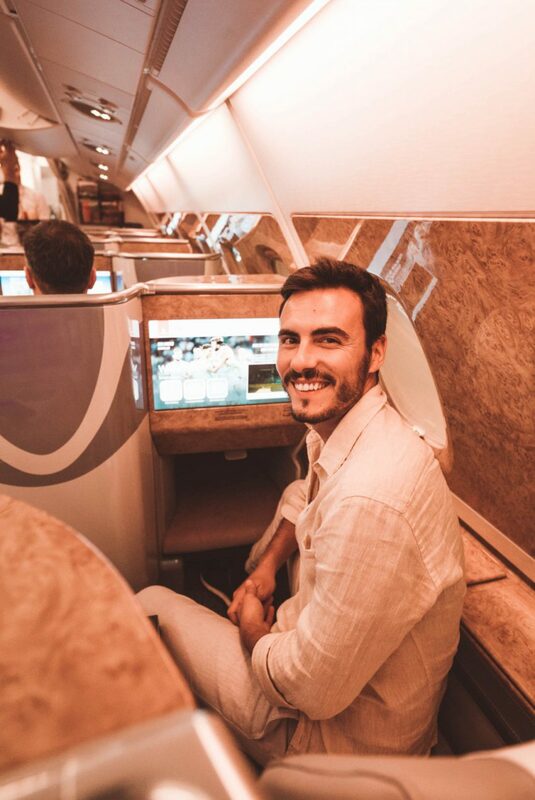 To be honest Emirates has the best meals on air, even when I fly economic, the food is great and I always ask to repeat… “Can you give an extra croissant?” ahah, yeh this is me! 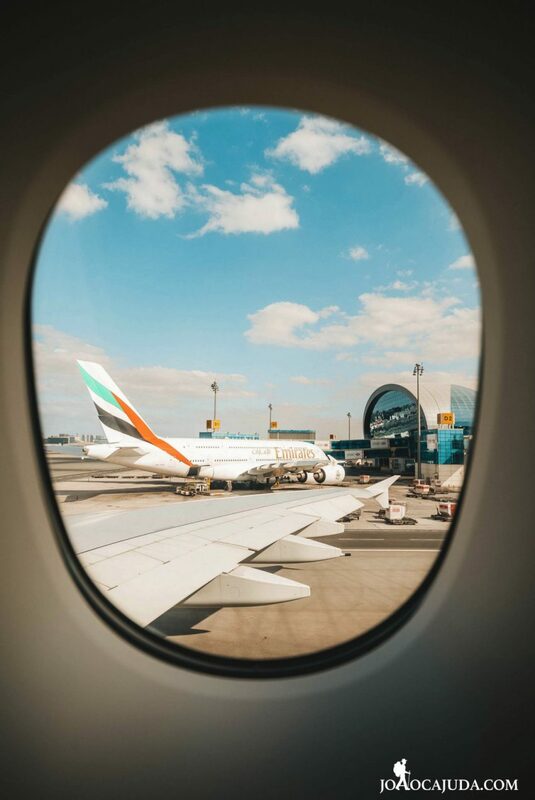 In addition to all this, Emirates takes into consideration the quality of their products thanks to its long standing partnerships all over the world, while also supporting local suppliers and craftsmen. This includes the acquisition each year of more than 15,000 kg of Persian Feta cheese from the Yarra Valley in Australia, or for example the oil served on board which comes exclusively from a carbon neutral producer on Mount Vibian, in Italy. The airline currently has 3.8 million bottles of wine stored in its wine cellar in Burgundy, France, to be served in the next seven to ten years. 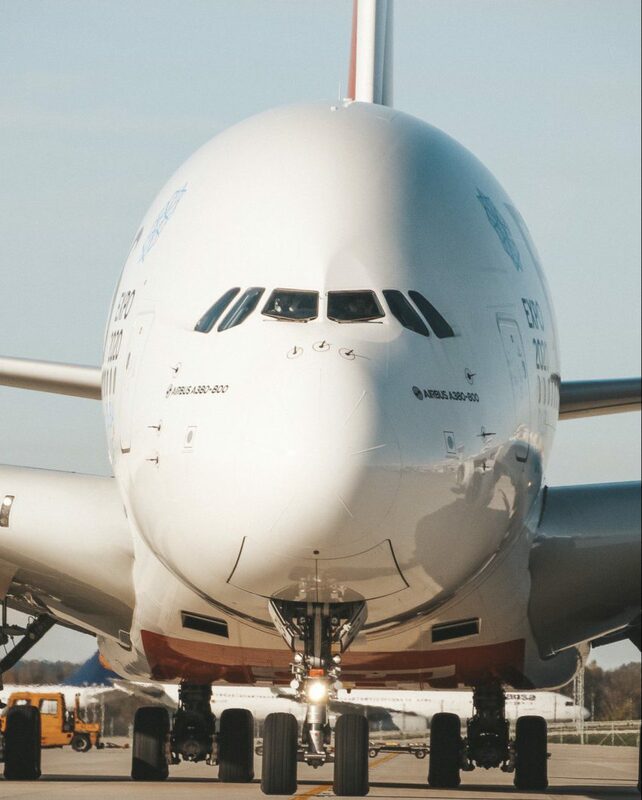 Check out the video I made while on board of Emirates during my trip to Australia. This post was sponsored by HBD. Hi! My name is João Cajuda, I’m a travel blogger from Portugal and founder of this website. 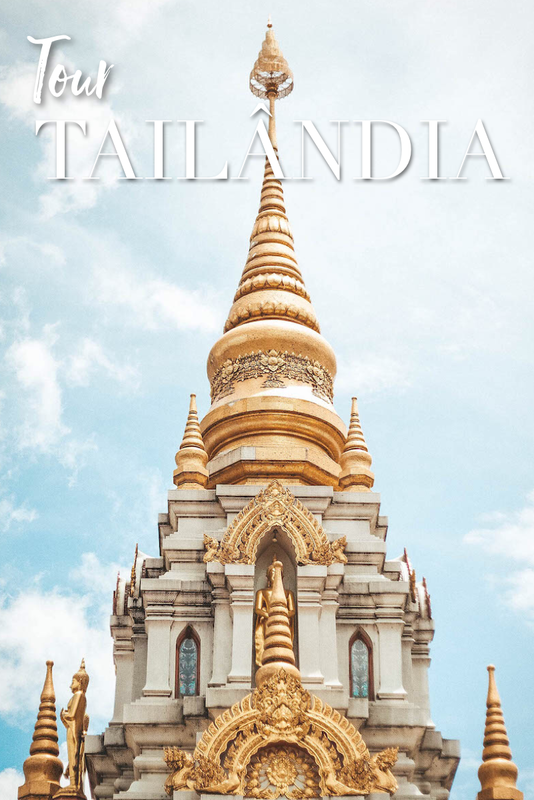 In this blog I share my adventures around the world and give you tips about hotels, restaurants, activities and destinations to visit. 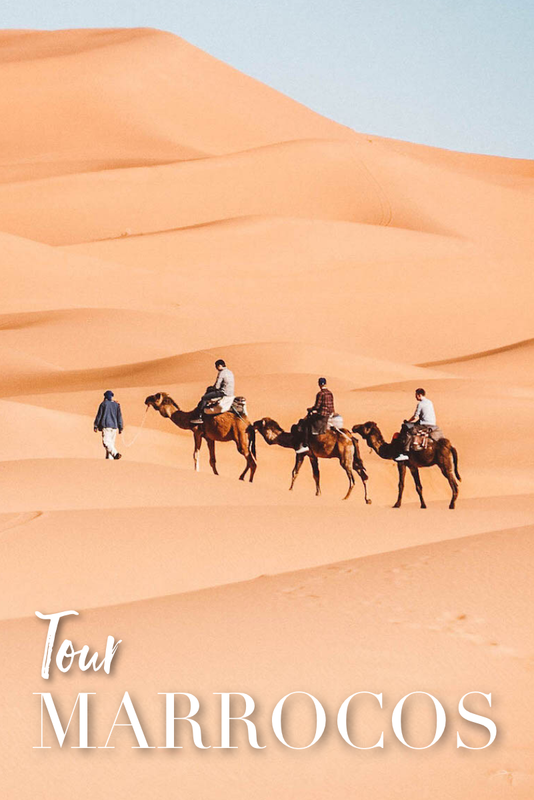 You can travel through my videos or join my group tours that I organize to selected destinations. 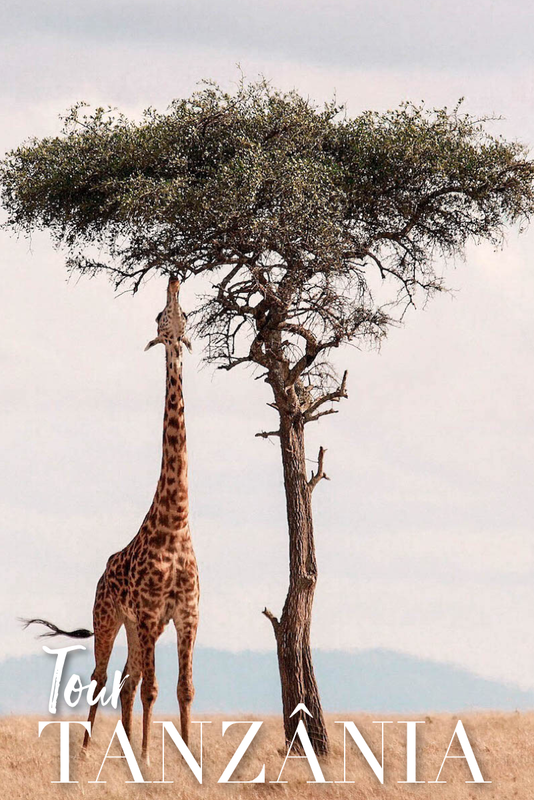 Visit my Adventure Travel Agency LEVA-ME and join one of my journeys! 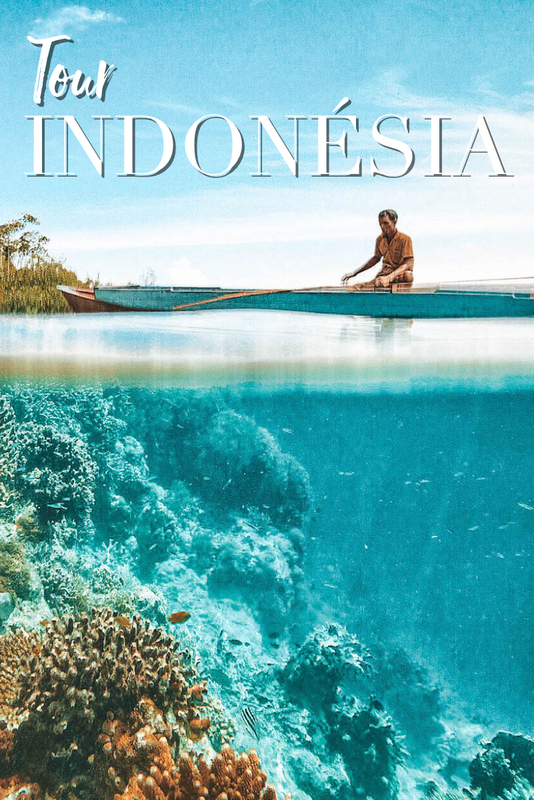 Join my FREE newsletter and get along with 650.000 travelers the best news and tips to travel more and better. 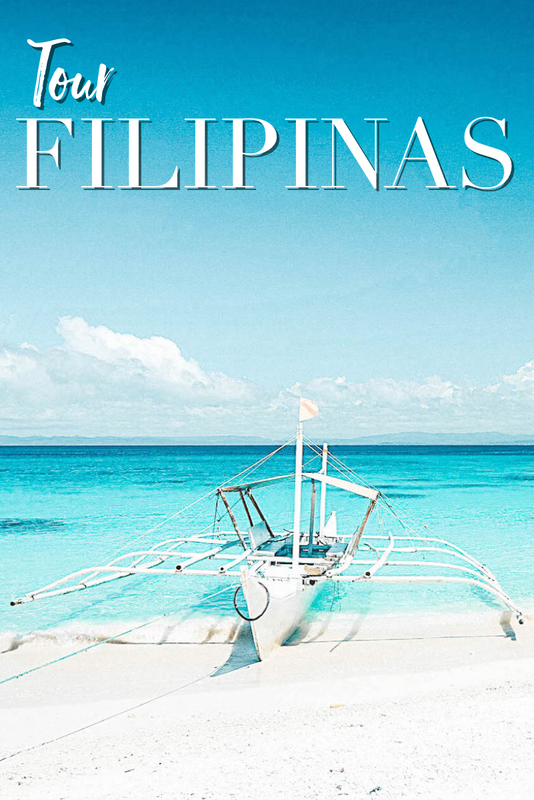 Join my FREE newsletter along with 650.000 travelers to get the best news and tips to travel more and better. I guarantee you to keep your privacy. No Spam!